Detection of buried antipersonnel landmines (APL) is a demandable task in which one tries to obtain the information about the soil and buried objects characteristics using various methods. In this paper the possibility of the active thermography application in APL detection is considered. The analysis is based on the mutual influence of the system scanning capacity and the quality of thermograms. The data are obtained by modelling and measuring for set-ups of several types of various objects buried in various soils. The necessity for localisation and identification of antipersonnel landmines, buried world-wide, has arisen during last decade. That task is done using prodders, specially trained dogs, metal detectors and ground penetrating radars. The methods listed are contact or almost contact non-destructive testing methods, which usage is in the demining accompanied with high risk level, large duration and expenses. Other detection methods are not reliable enough or the conditions for their applicability are not clear . These reasons motivated work on development of reliable, non-contact, safe and efficient antipersonnel landmines detection method [2, 3]. Among the methods used in researches there is the thermography [4-7]. Generally, thermography detects differences in infrared radiation intensity emitted from the surface of an object. The differences are caused by the different heat content of the object or its various parts, additionally influenced by the surface emissivity characteristics. When a non-homogeneous structure, having different thermal characteristics, initially being in thermal equilibrium with its surrounding, is exposed to heat stimulation the temperature difference occurs in the structure as well as on their visible surfaces . One differs the active and passive thermography. In active thermography the heat stimulus is an artificial heat source. The natural heat source is solar radiation. Its characteristics are known for a given region. In the region of south-eastern Europe the surface solar constant, i.e. the heat flux registered on the surface of Earth, on average equals 600 W/m2. Artificial heat sources are different heaters. Their heat flux can be much larger then solar heat flux. However, artificial heat sources of large enough heat flux are non-efficient because of relatively large energy consumption and additional equipment required. From combination of requirements for relatively small energy consumption and mine contaminated regions' characteristics one concludes that there are regions where thermography can be an efficient APL detection method. The examples of this type of regions are dry, vegetationless soils. On the contrary, in wet soils, covered with dense vegetation layer at the present level of development the thermography is non-applicable. However, the precise border of applicability of thermography is not known . In this paper the possibility for application of the active thermography for detection of buried objects is considered. The basis of the analysis are the results of experiments and numerical simulations of heat response of system consisting of soil and buried objects stimulated by heat. In the experiment, sand was used as represent of dry, vegetationless soil. 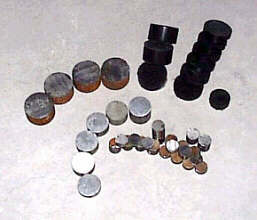 Buried objects were various cylinders in order to minimise the influence of objects' geometry. Additionally, in the particular measurement, we used the objects of same diameter made from the same material and set on the same depth from soil surface. Because of that, the free parameters were objects' heights and depths on which they were buried. Using appropriate scaling of length, time and heat flux, objects of given dimensions may partially substitute objects of the same material with different dimensions. In that way, the objects used represented antipersonnel landmines simulations. In addition, those objects may represent relatively small objects that may be buried above the APLs, whether that be triggers of some APL types or other objects. For that situation the experiment conducted gives the duration of the measurement that enables differentiation of situations where one object is closely under the other. The described set of objects used enables relatively simple interpretation and comparison of experimentally and numerically obtained results. The possibility of object detection is based on the recognition of object's signature on the thermogram of the surface. The possibility of object differentiation is based on the differences in thermograms that refer to the objects of different heights. In addition, different heights of objects make possible determination of optimal time interval for detection or differentiation of buried objects. The parameters that are important are the emitted power and time required for reliable respones. As the meaning of the reliable response depends on the signal processing algorithm used here the auxiliary measure is used as a criteria for reliability. Although that brings about a possibility of changes in results depending on the reliability measure taken, the experiment was set in such a way that the signal processing influence is minimised. In the next section the experimental part of the work is described, while in the third section the basis of numerical simulation is given. The results obtained are discussed in the fourth section, while the most important conclusions are given in the fifth section. The estimation of possible APL detection method based on thermography was experimentally performed by joint efforts of Laboratory of Non-Destructive Testing and Laboratory for Applied Thermodynamics at the Faculty of Mechanical Engineering and Naval Architecture, University of Zagreb in Croatia. Fig. 1a shows the experimental set-up. 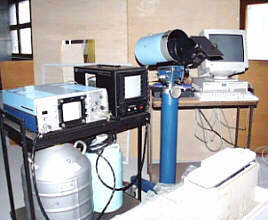 The thermovision camera AGA 680 Standard cooled by liquid nitrogen, the corresponding monitors and computer manipulated system for measurements of temperatures in different positions are clearly seen. For temperature measurements the thermocouples were used. The box visible on the same photography is divided in two parts each filled with dry sand of different grain size. The measurements were performed on the part filled with finer grain sand. The objects used in measurements were homogeneous cylinders of different dimensions and material, fig. 1b. In one group of measurements we used two cylinders made from polyetilen, with 62 mm diameters, whose widths were 12 and 30 mm. The upper, mutually parallel planes of these objects were 10 mm below the sand surface, fig. 2c. The third, control group of measurements, done to check the experimental set-up, included two equal polyetilen objects of diameters 62 mm and heights 30 mm. Fig 2: a) Schematic representation of the sand and buried objects, b) and c) configurations of objects in groups of measurements. Thermocouples were put on upper and lower objects' plane. Additionally, temperature of surface was measured to enable sand surface temperature quantification using thermogram. Sand surface was heated using infrared heater. The heating with constant heat flux lasted given before given time after what the heating was turned off. Temperature measurements included the heating and the cooling phases. Results of experiments are shown for described configurations of objects. Heating by infrared heater with heat flux of 6000 W.m-2 lasted 900 s. Temperature was recorded during heating and additional 3000 s during cooling. Temperatures of centres of upper surfaces of objects and centres of lower surfaces of objects 1 and 3 were recorded. The surface temperature means temperature of soil 1-2 mm under soil surface. It was measured on the half distance between the objects. Graphs of time dependence of temperature for objects' configurations used is presented on figures 3a and 3b. Fig 3:Time dependence of temperature. Objects were set as shown on a) fig. 2b, b) fig. 2c. Solid lines reffer to surface temperature, dashed to temperatures of object 1 and 3 upper planes' centres, dotted for object 2 and 4 upper planes' centres, and bold to temperatures of object 1 and 3 lower planes' centres. The numerical analysis of heat transfer is based on the application of control volumes method. The coefficients standing with temperatures in equation (2) are defined on the basis of dimensions of respective control volumes and accompanied thermal conductivity coefficients. If the equation (2) is written for every control volume one obtains a set of algebraic equations. By solving that set one obtains the values of temperature of all the control volumes in a given moment. The control volume's net is set so that regions of higher thermal gradients in the model are accompanied with locally denser net. The larger number of control volumes in these regions enables better information about temperature distribution. Buried objects are treated as non-homogeneities in the structure of primary material, i.e. soil. In the analysis they are invoked through changes of the primary material characteristics: density, specific heat capacity and thermal conductivity. As thermal non-destructive testing is based on the heat transfer through a material, bringing into interaction one control volume with neighbouring control volumes, there is a problem to calculate the thermal conductivity for the length of heat conduction direction. The thermal conductivity was calculated starting from the equality of heat flux density on a distance d xe and heat flux density obtained if it were calculated using appropriate thermal conductivities l E and l P of chosen control volumes P and E with accompanied distances. Numerical solving of tridimensional, nonstationary heat conduction requires initial and boundary conditions, that are taken from the experimental part of the work. From the graph given on fig. 3a one sees that during heating the considerable changes in temperatures measured on upper planes of objects and in surface temperature occurred. On the contrary, temperature of lower plane of object 3 virtually did not change. That shows that during heating the considerable amount of heat was transferred by conduction through soil above the objects, while there was no considerable heat transfer in the objects. Temperatures of upper planes during heating reached 200 oC. The object upper planes' temperature difference at the end of heating was equal 26 oC. The cooling phase starts with rapid lowering of temperature of upper planes and of surface temperature, while lower plane temperature continues to raise slowly. Approximately 10 minutes after cooling started various temperatures measured are almost equal, after what the cooling was relatively slower. In that, slower part of cooling several times the order of measured temperatures was changed. Till the end of measuring, temperature of lower plane of object 1 becomes the highest among the measured temperatures. The radiative heat flux was transferred to the soil surface. After that, by conduction it was coming lower soil layers and upper parts of buried objects 1 and 2. The higher object 1 has larger thermal capacity than lower object 2. Because of that, temperature of upper plane of object 1 during heating is lower than that of object 2. This means also that for soil parts above the objects, the upper plane of the object 1 represents more intense heat sink than of object 2. Because of that the conduction on the upper soil-object 1 interface is stronger. That is seen during cooling when the highest among measured temperatures is temperature of the upper plane of object 1. However, thermal conductivity of materials is relatively small, because during heating there is no considerable change in temperature of lower plane of object 2. During cooling the quantity of heat in soil above the objects lowers because of surface cooling. Effectively, for this layer the objects serve as heat sources. Like in the heating phase, temperature of upper plane of object 2 is higher than of object 1. Thermograms in different moments show that, as seen from the surface, during overall system cooling different objects in different moments figure like heat sources of different intensity. Although the objects are axially symmetric, thermograms shows deviations from axial symmetry. Using the active thermography, on a given set of objects put in homogeneous, dry and vegetationless soil, the non-stationary thermal field was realised. This field is rather sensitive on the physical properties of objects, that represent soil non-homogeneities. The difference in physical properties means that in the relatively large time interval of heating and subsequent cooling of heated region large enough temperature differences are obtained. Differences in temperature enables buried object detection and their differentiation. However, in non-homogeneous soils the possibility of buried objects detection and differentiation becomes questionable. Krstelj, V.; vaic, S.; Stepanic jr., J.; Malinovec, M.: NDT Methods in Landmines Detection, Int. Conf. Defektoskopie '99, Hradec Kralove, Proceedings, 1999., pp. 251-256.